I pick up a subway map and plot my way to Sky Tree… hey this is easy, I just take the Oeda line to Kisume-Shirakawa, connect to the Honzemon line and ride three stops to Oshiage Station and Sky Tree. My experience of the subway system from five years ago, and better understanding of the language, including kanji, are serving me well. I enter the Tokyo Metro system at the Monzen Nakachou Station next to the Mister Donut. This is my first time on Tokyo Metro in five years! I exit the Oshiage Station, walk out onto the plaza and am amuzed by the feeling of Deja Vu, entirely from watching NHK programs featuring this plaza beneath Sky Tree. 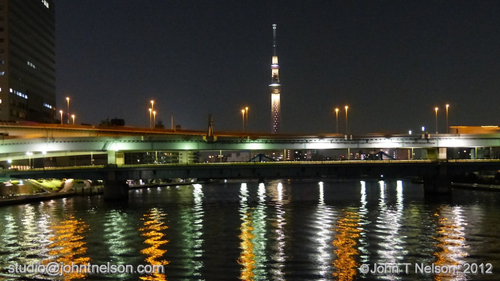 And there it is… after five years of waiting I finally get to see Tokyo Sky Tree in person! Wow is that an impressive structure! The plaza is swarming with eager cell phones and point & shoot cameras blazing away. 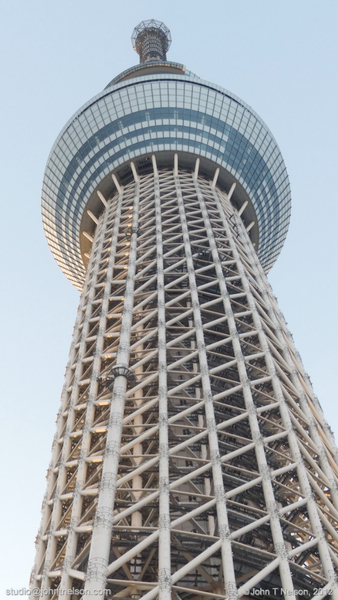 Sky Tree planners knew this was going to be a huge draw so they wisely built a huge shopping complex called “Solamachi” at the base of Sky Tree to cater to visitors. They have a Totoro store! Having a place to while away the hours is also important when waiting for your timed ticket slot. According to the current signage, assigned timed ticket holders are allowed entrance to Sky Tree some FOUR HOURS from now, which puts me in Sky Tree at 6:30 – 7:00, well after sunset. My laid back birthday got a little too laid back. The information desk gives me directions (in Japanese) to the Starbucks where I buy a Venti Mint Green Tea. Armed with snacks and hot tea, I plant myself in a comfortable chair on a sunny landing looking out onto the sunset behind Sky Tree … along with a bunch of other old fogies snoozing in their chairs and couches. I guess this is what awaits me in my old age. Munching on Taiyaki and sipping my piping hot green tea while watching the sun sink towards the horizon. Watching rambunctious children and happy families swarm to the balcony outside to grab pictures of the sunset behind Sky Tree. The premium view, however, would actually be on the other side that captures the light of the setting sun. Sunset and the magic hour arrives. The entire Solamachi complex, even down to the placement of the trees, feels like it was designed to accommodate Feng Shui and composition for a beautiful and dramatic view of Sky Tree. This is the moment I’ve been waiting for and I’m working the camera with paparazzi like fury. The Sky Tree light show begins, a little at a time, starting with a violet colour that is compatible with the sunset. Oh man, someone put a lot of thought into even the most subtle details when Sky Tree was designed. Time to head back to hotel. My friend Andrew just blew into town so if he isn’t sleeping off his flight into Japan, maybe we’ll have dinner at one of the old haunts in town. On my way back to the subway, I note that this is a beautiful shopping space, large and with lots of family amenities. Like most of Japan, however, not enough space to sit and relax. As I enter the B3 Oshiage Station I get the shake down for Y1000 from a bunch of feral children who need money to get home. I’ve already met The Prince of the Streets, now I feel like I’ve met The Prince of Thieves. A Japanese man approaches me and asks if I need help and I reply that I’m fine, I just like understanding the train system thoroughly. It turns out that he is a former train conductor and signal man so we discuss the subway and JR systems in both Tokyo and Kyoto. He compliments me on my Japanese language skills.